I’m hoping it’s not a sign of age, but as we contemplated spending a week aboard a French canal boat I couldn’t help but consider this. Was cruising or barging something that only appeals when you reach a certain age (whatever that age might be)? Would being on a slow-moving barge compromise our reputation as independent travellers, who hate being told what to do and where to go? Travelling on someone else’s timeline is not something that appeals to us as a general rule. All these thoughts and so many more were constant visitors to my mind the minute we agreed to take a ride on the luxury barge Savannah on the Canal du Midi in the south of France. Such thoughts, never truly left my head until I was aboard, with a glass of French champagne in my hand. Having been able to spend some one on one time with Adrian Bramoullé, owner and captain of the Savannah at the time of our pickup had started to allay any concerns I might have. Over the course of the week, I realised that through opening up my mind and letting in a different experience, we had found something we truly loved, and I knew we would be up for doing it again. Let’s answer some of these questions about French barge holidays now because I know there are many others like us. Let’s face it, no-one wants to consider themselves to be getting old and doing things that are expected of a certain age group. At the same time, I’m quite sure no-one wants to shell out a bucketload of cash and not enjoy the experience, just to say they’ve “given it a go”. The Savannah is just one of many luxury barges that operate on the French canals. There are also several other barges on the Canal du Midi. There is, however, only one Savannah. This is a detailed Canal du Midi cruise review, compiled by real travellers who have been on the barge, to allow potential guests the opportunity to get some authentic insight before spending a lot of money. How many people will be on the luxury barge? This isn’t a party boat, nor anything like the riverboat cruises that travel the major rivers of Europe. Despite the Savannah being 30 metres long and weighing 180 tonnes, it’s not packed full of people. The Savannah is a luxury barge, catering for people who like to travel slowly and enjoy the scenery as it passes by. It’s also a place where guests can unwind and take pleasure in the serenity of the canals. There are four cabins (3 double and 1 single) for up to seven guests. That’s right, the maximum number of people enjoying the hospitality on board can only ever be seven. In addition, there are three crew members; the captain, a host and a chef. Even for those people who consider themselves introverted, you’ll never have a huge throng of people thrust upon you at any time. Are barge cruises for old people? Absolutely not! Despite my initial thoughts, anyone can have a good time on this type of barge holiday. Old or young, single or couples, families and groups of friends, there is plenty for everyone of all ages to do. In fact, if you are planning on getting a group together and booking out the entire boat, just talk to Adrien as he just loves to try and personalise things for you. For example, a group of biking enthusiasts booked this barge, and onshore activities included riding Tour de France type bikes. In 2018, the Tour de France ran through Carcassonne, so special trips were planned to make the most of this occasion. The itinerary can be adapted for certain themes like wine tasting or with a gastronomy focus. On the Savannah, children can be catered for with such things as fishing trips cooking lessons and other activities. If you’ve got the cash, helicopter rides and other adrenaline activities can be considered. Is there much room on board a luxury barge on a French canal? There’s plenty of room to move around! Most of the upper deck is able to be used. Tiled in beautiful terracotta by the captain, a perfectionist in every way when it comes to the appearance of his boat, the upper deck is a delightful place to spend your time on board. Apart from being the best spot to watch the world go by, there’s a place to dine, and various other seating arrangements to ensure your relaxation. You can sit with the other guests, or find a quiet spot away from everyone. There’s also lots of room downstairs too. You will be surprised by the amount of space. 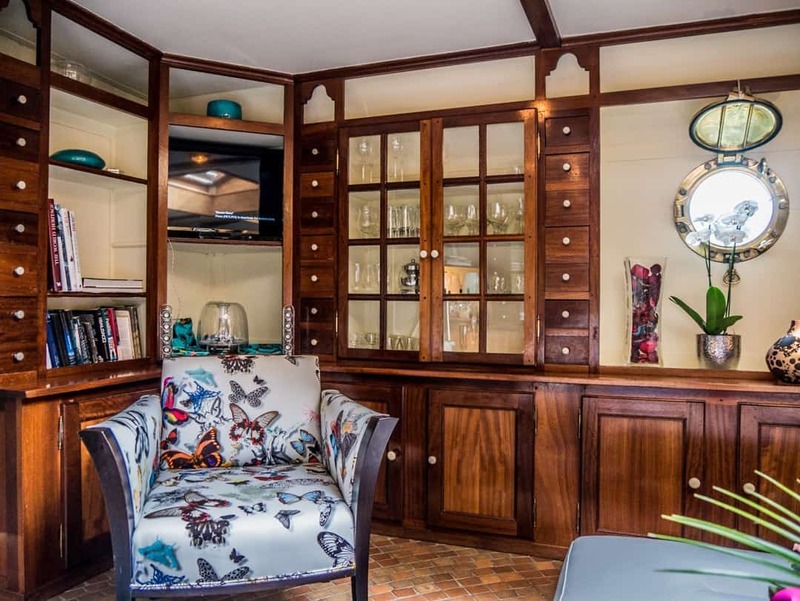 What are the cabins like on a luxury French canal barge? Considering you are on a barge they are amazing! Named after areas in the south-west of France, the cabins are of a very good size. At the front of the barge, the ‘Lauragais’ is the largest of them all at 160 square feet. It has a private entry from the upper deck. Accessed from the lower deck, the 130 square foot ‘Minervois’ and ‘Corbieres’ cabins sit side by side, just off the salon. With solid iron walls in between, they are your private sanctuaries whilst you cruise. The single cabin, ‘Malapere’ is located off the salon and is much smaller at 60 square feet. There is a small hanging cupboard and shelf in the double cabins and a bedside table. There is one powerpoint in the room and another in the bathroom. If you travel with plenty of devices and gadgets like us, I recommend taking either a power board or double adaptor at least. The beds are extremely comfortable and all linen and towels are of very good quality. All cabins are air-conditioned, have skylights and also portholes which can be opened. Personally, I don’t think anyone would be displeased with any of the double cabins. If you do believe you want private access and a touch more space in your cabin, the ‘Lauragais’ is the one to request, but seriously, I don’t believe there is any real difference. They also have stand-alone ensuites with full standing height shower and flushing toilet. The water is of excellent pressure and heat, two of the things I love. 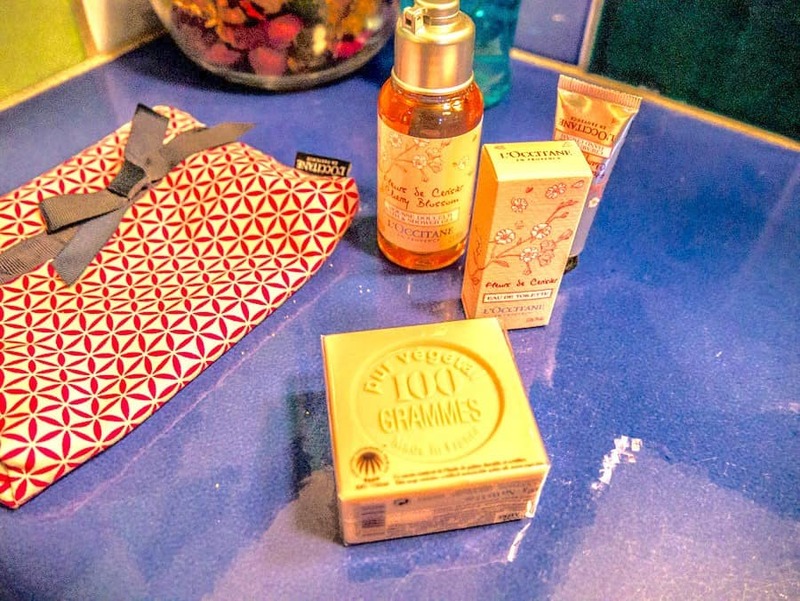 In a nod to the Savannah’s former life as part of the L’Occitane business, toiletries from this well-known French company are also included. Just like in a hotel, your rooms are serviced every day. There isn’t a lot of storage for your luggage onboard, so if you can limit this, you’ll be all the better for it. If you have lots of luggage, like we always do, it’s no issue either. It just means you need to manage it in your cabin. One of the most beautiful areas on the Savannah is without a doubt the salon. If there is one part of this barge that speaks directly to the owner’s attention to detail, then this is it. Personally sourced material, decorated in vivid butterflies from designer Christian Lacroix was used to make the armchairs. Terracotta tiles, like those upstairs, have been laid in a circular pattern and offset by a plush rug underfoot. Sleek, shiny mahogany cabinetry surrounds the room and ties it all together. Nothing is out of place. Every detail, right down to the Lindt chocolates, the wide range of alcohol in the open bar that caters to everyone’s tastes, the books, the music and the fresh flowers all come together to make this a perfect place to spend some time. Just outside the salon, and at the bottom of the main set of steps leading downstairs from the upper deck is the dining room and kitchen. The kitchen, though small, is capable of producing some incredible food. The table is set beautifully for each meal that is eaten here. When the weather is accommodating, meals can also be taken upstairs. Where does the barge go on the Canal du Midi? The Savannah takes you on a journey either up or down the Canal du Midi, a 240km waterway between Toulouse and Sète. The six-day cruise takes in about 60 kilometres of the canal, beginning at the Aiguille Lock and passing through Marseillette, Villedubert, Ladouce, Villeseque and Beteille until it finishes near Bram. (or the reverse if heading in the other direction). What do you do all day on the barge? Included as part of your luxury barge cruise on the Savannah is a range of day trips. All are fully guided, and private transport is arranged to look after you. There is no need to plan anything for yourself, and all activities and excursions are included in the price. Adrien will usually always accompany you, and sometimes one of his team will too. If you aren’t interested in one of the trips, or you just need time out, staying on the barge whilst everyone else heads out is also an option. The trips start after breakfast or after lunch, depending on the cruising schedule, and usually last for around half a day. This means there is a nice blend of time on and off the barge. Highlights include visits to one of the most beautiful villages in France, Minerve. A trip to the fully walled, medieval city of Carcassone is also amazing. The wine region of this area is unknown when compared to the other well-known areas of France. I like to think of it now as our little secret, having been able to experience a thriving area without the fuss of tourists by the hundreds. Great wine and great people make up the vineyards of this region and it was wonderful to be able to visit generations-old wineries and sample their produce. We couldn’t believe that we actually got to drive these classic French cars ourselves. Winding our way through the countryside, wind in our hair was the perfect experience. Stopping at chateaux along the way was the icing on top. I’m sure you can imagine how much we loved this. Even if you aren’t interested in food and markets like we are, hanging out with your private chef, watching them select the food for your next meal, and even helping to choose ingredients yourself is a special event not to be missed. It’s France, so of course, there are bound to be a chateau or two in your path. We got to explore the inside of Chateau de Pennautier, an historical gem still owned by descendants of the same family of the original owners. The Savannah carries enough bikes on board for every guest. Riding a bike is easy along the canals. The towpath is generally flat and easy to ride on. The bikes are simply taken off the barge at a lock and we later re-joined the barge at a lock designated by the captain. If you are interested in riding, a quick chat to Adrien will work out the locks that are appropriate to get on and off at, according to your level of fitness. Some locks are relatively close together whilst others can be kilometres apart. If riding isn’t your thing, you can also elect to walk along the paths. No way! We returned one evening to find musicians on our barge. Adrien was not only a great captain, but his thoughtfulness and care of his guests were obvious at every turn. In this instance, he invited two local musicians, people he befriended many years ago, to entertain us as we sipped more French champagne. As the sun ended its job for the day and sunk below the horizon, we all reflected on what an incredible experience this was. The great thing was we were only a few days into the trip. Following dinner, the music continued well into the night, downstairs in the salon. 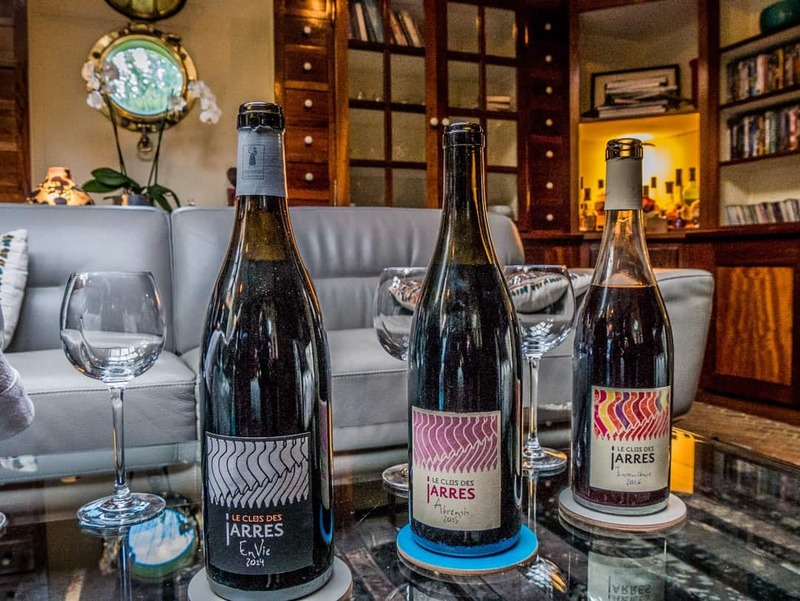 Keen to showcase more of the region’s local wines, we also had personal visits by the winemaker, who came aboard to guide us through the various offerings. Cruising along the Canal du Midi is slow and peaceful. There are other watercraft on the canal, and in the peak season, you will see a greater number than what we saw in September. The main “issue” in peak would simply be the time taken to get through the locks, as the barges all queue up. This is where the Savannah comes into her fore though. As a commercial operator (hotel barge, the Savannah gets right of way through the locks as they are “booked in”. It also helps no doubt that Adrien has built up wonderful relationships with all of the lock keepers. The odd croissant and cup of coffee that we saw the chef take to the keepers wouldn’t hurt either! Unless you have also cruised on canals very regularly, the whole theatre of the locks opening and closing and watching the barge go from the bottom of the canal to the top is really interesting to watch. As a guest and not a driver, there’s no pressure during what can be a tricky process to manoeuvre. We can simply sit back, have a drink, and watch it all unfold. The Savannah is moored every night at a country location along the canal, not in the main ports usually frequented by the rental barges. The Savannah has a water supply capable of lasting the entire week and generators for electricity, meaning Adrien is not forced to use the facilities in the towns. This means that every night is quiet. The only sounds you will hear will be the sounds of nature. Will I get seasick or motion sick? I’d like to say it’s not possible but nothing is 100% guaranteed. However, I can be 99.9% sure that even if you are someone who gets seasick normally on a boat you will not on the Savannah. I’ve been known to be seasick before, but this barge just doesn’t move fast enough. At 4 km/hour, it’s not going to win any speed records. The waters are smooth, calm and tranquil and apart from the moving scenery, you’ll never know you are on a boat. What’s the food like on the barge? With a fully trained chef in charge, and access to the freshest of ingredients, sourced locally where possible, the food is one of the highlights of the barge cruise. You’ll hear comments of “how can we possibly eat any more?” and “I think I might miss breakfast today” such is the quantity of food you’ll be faced with. What I never heard, however, was “I’m hungry” or “I feel like a snack”. Three meals a day served in style and always at a fully dressed dining table was something we looked forward to. It’s all about embracing the French way of cooking and eating their food. There’s no tourist menu here, although I’m quite sure if you wanted something specific, the chef would do their best to help you out. Of course, if you have a dietary issue, or just don’t like certain foods (sorry everyone I just can’t do foie gras! ), then this will be accommodated easily. What clothing do you need onboard a luxury barge on the Canal du Midi? If you haven’t been on this type of a cruise before it’s often hard to get simple, yet accurate information on the type of clothing that is required. If you are trying to pack lightly, it’s great to have an idea of what you will need to wear. The great thing about the Savannah is that there is no need whatsoever for pomp and ceremony. The Savanah is a place to chill out and relax. The first point to note is there’s no specific dress code required for the barge or the day trips. Wear clothes that you will be comfortable lounging around in or sitting at a dining table. For the day trips, it’s probably best to have comfortable walking shoes. Some days I wore flat boots on the day trips, other days just flat dress shoes. Stirling wore Skechers or boots. We took one jacket each. Even if you go during summer I would still recommend a light jacket just in case for the evenings. Exercise clothes. These are not essential though as it’s reasonable to walk or ride the bikes in normal day wear. We took extra clothes for the evening, as we thought that we would be expected to change for dinner. Most of the time we were either just returning from our excursions or just too relaxed to bother changing. With only a few guests on board, there really is no need. We also took a set of more formal clothes for the final dinner. Whilst it was nice to get a little more dressed up, again, there really is no need nor expectation. You also won’t need umbrellas as they are available to use on the boat. Does the canal barge have wifi? Access to the internet rules my life so even when I’m meant to be relaxing, I need to know I can access data. Free wifi is provided on board but it is patchy and should not be relied on. If you are on a digital detox or just don’t care whether you are connected or not, then this won’t bother you one bit. Alternatively, if you are travelling, you could consider getting a local wifi hotspot. We used Hip Pocket Wifi when we were on the barge and had access the whole time in Europe. There’s an open bar? What does this mean? I’m sure you’ve seen this one before too. Promises of an open bar that ultimately means that the drinks are free flowing for the period of meal times. (lunch and dinner). Maybe it might include an afternoon drink or aperitif. When you are on the Savannah, open means open. The bar is open 24 hours a day. If drinking French champagne is your thing at breakfast, or a sneaky cognac just before you go to bed is the perfect elixir, then you can have it. Drinks on the deck at 3 pm? A mid-morning Campari? No-one makes any rules, just head to the bar whenever you wish. How much does a week onboard a luxury barge cost? It’s not an inexpensive trip, but it’s well worthwhile if having a barging holiday in France is your thing. For the most accurate costs, it’s always best to go straight to the source. The barge may be booked out for groups, or as individual cabin bookings. How many times do you pay a lot of money for a tour or a cruise, only to find out that there are so many hidden extras? When you pay to travel on the Savannah, all inclusions and any exclusions are made very clear up front. That being said, there are very few exclusions, the key one being travel insurance. This, of course, should always be a personal cost. If you arrange for a different point of pickup and drop off that is outside of the usual locations, expect to pay an additional fee. Currently, the pickup/drop off point is in the town of Narbonne, in south-west France. Tips are also not included. There are supplements for single bookings. Unless you negotiate other activities or special requests are made, then expect there will be no other additions. Specifically, if you book a cabin and don’t change anything, your price is all-inclusive. Transfers to and from the barge from the agreed meeting/drop off point. All off-barge excursions and visits to all attractions including any relevant entrance fees. Where do I book the luxury barge? 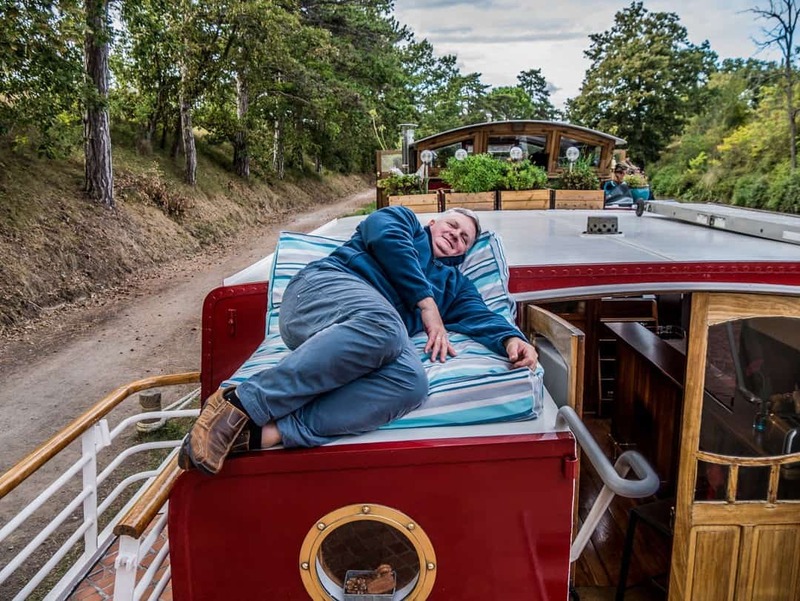 To book a canal holiday in France, you can contact Adrien directly via the Savannah barge website or you can use one of several agents like Barge Lady Cruises who specialise in luxury barge cruises on the European canals. Narbonne is the city where pick up and drop off occurs. Located in the south-west of France, it is serviced by several airports and a train station. For quick access into Narbonne, we would recommend flying or taking the train. The nearest airport is Béziers Cap d’Agde and is 47 kilometres from Narbonne. Both domestic and international flights are possible here. We use Trainline to buy our tickets online. The tickets can be accessed via their app on your smartphone. Where can I stay before the French barge cruise starts? Narbonne has a number of good hotels in the centre of town. The premier hotel here is La Residence, located on the corner of a quiet street in the centre of the city, a short walk from the Canal de la Robine and the main square and cathedral. If you are looking for a very central spot, this is the hotel to stay in. Narbonne is a beautiful city that we might never have found if it were not for our trip on the Savannah. You can read the travellers reviews and see the room photos on Trip Advisor. The La Residence Hotel is also the pickup location for the Savannah. We stayed at Zenitude Hotel-Residences Narbonne, a short walk out of the centre, but very close to the main promenade area of the Canal de la Robine. These apartments are self-contained and a little bigger than the standard hotel room. Trip Advisor reviews can be found here. We also stayed at an Airbnb on our return to Narbonne at the completion of the barge trip. Overlooking the canal, and diagonally across from the cathedral, it was an excellent alternative to a hotel and our preferred place to stay if we were ever in Narbonne again. Hopefully, this article will make you want to book a canal boat holiday on the Savannah right away and that when you do, you’ll have all the answers to your questions at hand. If you have any more questions, don’t hesitate to email me. If you are looking for even more detail on what you’ll do as part of the cruise aboard the Savannah please read my articles below that I wrote for The Fit Traveller. We loved the Savannah and we know you will too. Beer and Croissants was a guest of The Fit Traveller and Barge Lady Cruises. We truly had a fantastic time on board, and as always all opinions, editorial and images are always our own. That looks absolutely lovely. We had the same conversation with ourselves about age and boat trips, but then we’d have enjoyed it just as much in our teens and twenties. I think I’d need the towpath walking to keep hungry for that delicious cuisine – and impressive to see it emerge from such a small galley. It really proved to me that it’s an experience for any age. I think the ultimate would be getting a group of friends or family together and hire the whole barge out.